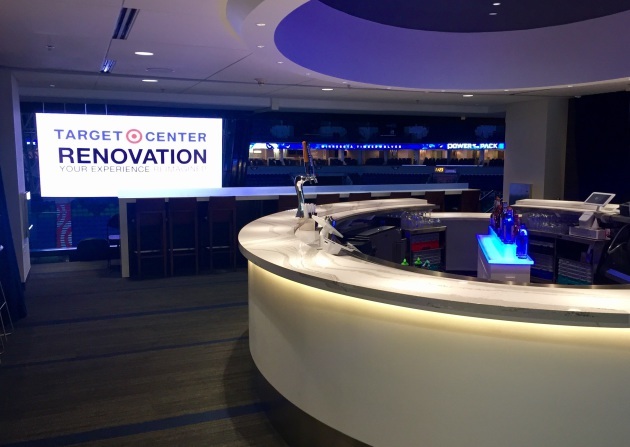 Video (02:42) : Target Center is nearing the end of Phase 1 of its 18-month renovation and unveiled the updated premium level Tuesday. The transformed space includes a luxury suite and food experience and adds natural light into the stadium. Target Center is no longer the ugly duckling of the Twin Cities stadium lineup. The 26-year-old building unveiled its renovated premium suite level Tuesday, touting its new luxury experience as good as any in town or the region. The grand opening for suite holders is the Nov. 1 Timberwolves home opener. They’ll experience expanded club space, new-to-market suites and boxes, a gourmet dining experience, a bar overlooking center court, views of the Minneapolis skyline and Hennepin Ave. through new floor-to-ceiling windows, and upgraded traditional suites. “We all knew this was a big bunker. And one of the strategies we have in the renovation was to try to pop through that exterior and let some natural light in,” Johnson said. “The bricks and mortar are sort of a physical transformation,” he added, “but it really is about the overall transformation in the fan experience and how we approach things. … The renovation is sort of the physical part, but it’s part of the larger transformational story of the entire franchise. Target Center, the fourth-oldest stadium in the NBA, was the first building in the country built with an entire suite level. Previous renovations altered that setup and now the number of traditional suites has been reduced to 24. The new design and attractions, however, offer an “experience unlike any other in this market,” said Ethan Casson, Wolves and Lynx CEO. Tuesday’s unveiling means Phase 1 (new scoreboard, suite level construction and acoustic improvements) of the $130 million renovation is mostly complete. Phase 2, expected to be completed in Spring 2017, is already underway with exterior work and will include loading dock improvements and a marshalling yard. Phase 3, scheduled to start in Summer 2017, will include a new lobby, locker rooms, dressing rooms, public restrooms, concourse improvements, additional club spaces, and food and beverage improvements. See more images of the renovation in the above video.